Leader of Rocking Simchas, Mitch began performing as a teenager in Long Beach on tuba and bass guitar. After getting a degree in biology, Mitch returned to performing 10 years ago and never looked back. He is a member of several different Jewish bands, each playing in their own, uniquely cutting-edge styles: Moshiach Oi!, Blanket Statementstein, Mr Shabbos Show, and White Shabbos. He has recorded several albums of original music, playing in synagogues, yeshivas, shows, nursing homes, camps, clubs and intentional communities around the world and in Jewish, multi-faith, and non-affiliated spiritual contexts. Mitch is playing a leading role at the NYC emerging alt-Jewish scene redefining what it means to be a 'Jew' and has been featured in two documentaries recently: Punk Jews and Tikkun Olam. After playing at over 100 weddings and other simchas here and abroad, Mitch founded Rocking Simchas with the intention to create a new deal in music entertainment: to make your celebrations rock! Joe Palmieri, Paul Pesach Alpert, Dan Wagner and Menashe Yaakov, Chaim Zalman Levy, Noam Siegel, Bruce Parness. 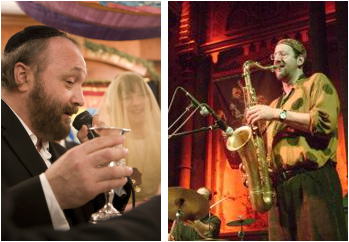 Rocking Simchas works with over 20 regular musicians in all different styles and connected to over 100 musicians in the industry in the metro NYC area, serving as a clearing house for any music style and budget you are working with. Rocking Simchas could connect you with Jewish superstars such as Yehuda Green, jazz giants such as Greg Wall, world famous klezmer performers, rappers such as Y-Love and Ephryme, world-hop musicians such as Darshan, reggae Jewish musicians as Rocka Zion, punk rockers such as Moshiach Oi!, sitar heroes such as Ikhlaq Khan, Stereo Sinai "Biblegum Pop", or cutting edge electro DJs upon your request and work with your needs.